Mehripour, H., Rashidi, A., Zahravi, M., Ebrahimi, A. (2014). Study of Relationship Between Related Yield Traits Using Correlation and Regression in Wild Barley (Hordeum Murynum). International Journal of Advanced Biological and Biomedical Research, 2(6), 2120-2126. Hossein Mehripour; Abolfazl Rashidi; Mehdi Zahravi; Asa Ebrahimi. "Study of Relationship Between Related Yield Traits Using Correlation and Regression in Wild Barley (Hordeum Murynum)". 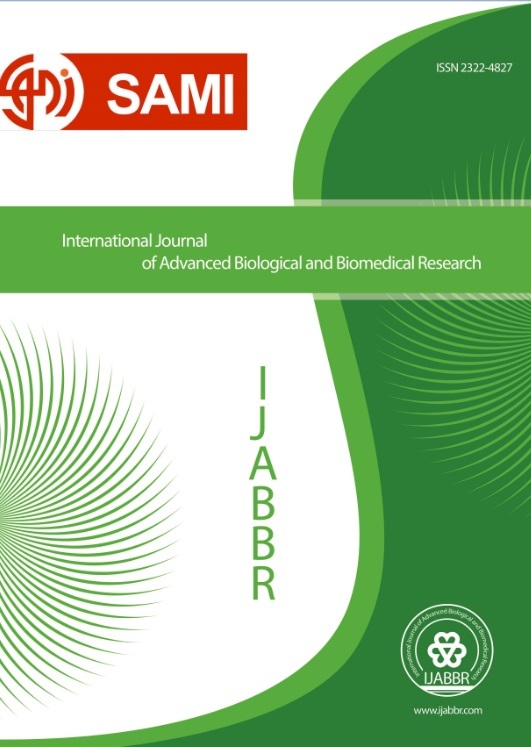 International Journal of Advanced Biological and Biomedical Research, 2, 6, 2014, 2120-2126. Mehripour, H., Rashidi, A., Zahravi, M., Ebrahimi, A. (2014). 'Study of Relationship Between Related Yield Traits Using Correlation and Regression in Wild Barley (Hordeum Murynum)', International Journal of Advanced Biological and Biomedical Research, 2(6), pp. 2120-2126. Mehripour, H., Rashidi, A., Zahravi, M., Ebrahimi, A. Study of Relationship Between Related Yield Traits Using Correlation and Regression in Wild Barley (Hordeum Murynum). International Journal of Advanced Biological and Biomedical Research, 2014; 2(6): 2120-2126. Genotypic variation is useful to breeders when selecting genotypes to improve particular traits. Inorder to study of genetic diversity 20 genotypes of Hordeum murynum studied in the form of randomized complete block design the experimental field of islamic azad university shahre rey branch with 3 replication in the year 2012. Notes traits was conducted including days to heading, days to maturity, plant height, straw weight, harvest index, grain number per panicle, 10- panicle weight, 100- grain weight, biomass and grain yield. The results of analysis of variance showed that the significant differences were observed among genotypes for all morphological traits, except days to maturity and harvest index. Mean of traits classified using Duncan's multiple range test (p = 0.05). Line of 12-1092 produced the highest Plant height, days to heading, 10- panicle weight straw weight, biomass and grain yield. Correlation coefficients showed the grain yield has a positive at p= 0.05 and significant with biomass (r=0.97), number of nodes on the stem) r=0.72), 10- panicle weight (gr) and plant height. Stepwise regression analysis, grain yield as the dependent variable (Y) and other traits evaluated was considered as an independent variable (X). Results showed that the biomass and grain yield (with biomass) with 93.7% and 98.8% explained the maximum grain yield variation, respectively.